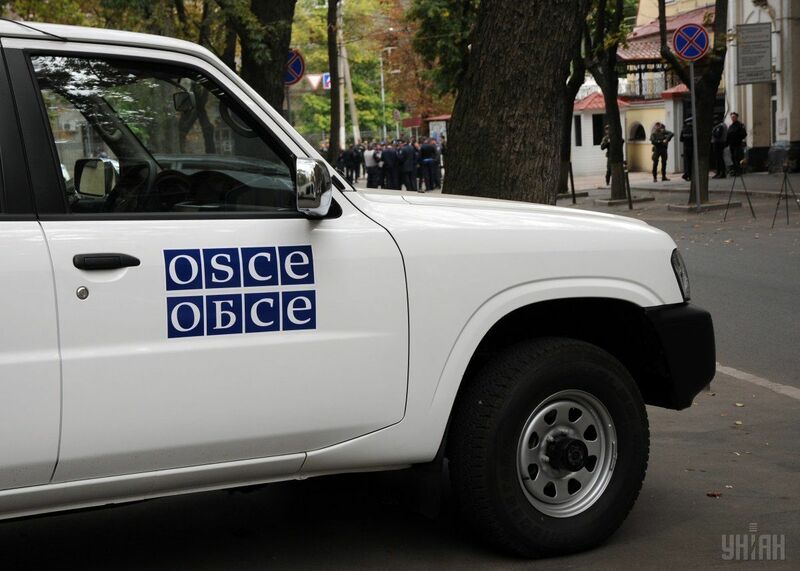 The OSCE Special Monitoring Mission (SMM) to Donbas has reported about the presence of over 180 tanks and howitzers in occupied areas in Donbas, eastern Ukraine, the seat of two self-proclaimed republics – the "Donetsk People's Republic" ("DPR") and the "Luhansk People's Republic" ("LPR"), according to an OSCE SMM update. "Aerial imagery revealed the presence of over 180 tanks and howitzers in non-government-controlled areas, as well as new trenches near Vodiane and the road M03 between Svitlodarsk and Debaltseve," the OSCE SMM said in an update based on information received as of 19:30 September 26, 2017. "In non-government-controlled areas, aerial imagery revealed the presence on September 25 of 49 tanks (type unknown) about 4km south-east of Ternove (57km east of Donetsk), 42 tanks (type unknown) about 3km west of Manuilivka (65km east of Donetsk), 32 tanks (type unknown) about 2km north-east of Kruhlyk (65km south-west of Luhansk), and 34 howitzers (16 self-propelled and 18 towed) and 30 tanks (type unknown) and 73 military-type armoured vehicles near Myrne (28km south-west of Luhansk)," it said. Read alsoOSCE spots at least 10 Grads, howitzers, tanks near occupied LuhanskOn September 22, an SMM mini UAV spotted nine mortars (three 120mm and six 82mm) near Myrne in positions that the Mission assessed as part of a live-fire exercise (outside the security zone). The SMM visited three border areas outside government control. "During one hour at a border crossing point near Uspenka (73km south-east of Donetsk), the SMM saw 36 cars (ten with Ukrainian, 11 with Russian Federation, and one with German licence plates, and 14 with "DPR" plates), three mini-vans (two with Ukrainian and one with Russian Federation licence plates), one mini-bus (with Ukrainian licence plates), and 26 trucks with covered cargo areas (18 with Ukrainian, six with Belarusian, and two with Russian Federation licence plates) exiting Ukraine, and 37 cars (16 with Ukrainian, ten with Russian Federation, one with Belarusian, and one with Azerbaijan licence plates, and nine with "DPR" plates), one truck with a covered cargo area (with Ukrainian licence plates), and five fuel trucks (all with "DPR" plates) entering Ukraine," the OSCE SMM said in the update. During five minutes at a border crossing point near Ulianivske (61km south-east of Donetsk), the SMM did not see any traffic. On September 25, during one and a half hours at a border crossing point near Dovzhanske (84km south-east of Luhansk), the SMM saw 59 cars (45 with Ukrainian and nine with Russian Federation licence plates, and five with "LPR" plates), two buses (both with Ukrainian licence plates), four trucks with covered cargo areas (all with Ukrainian licence plates), and 11 pedestrians (five men aged about 50, six women aged 20-50) exiting Ukraine, and 15 cars (eight with Ukrainian and seven with Russian Federation licence plates), two buses (both with Ukrainian licence plates), five trucks with covered cargo areas (all with Ukrainian licence plates), and nine pedestrians (six women aged 30-50, three men aged 20-60) entering Ukraine.